Many people are requesting for schedule record, and now wish comes true. 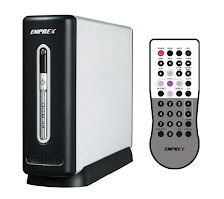 Emprex has released a firmware which has schedule record function, but File Copy is removed. The default language is set as Simple Chinese, you could need to change it back to English manually. Select the 4th icon for Setup(tool icon) -> Press left arrow key once for System(desktop icon) -> Press Enter key for language list(flag icon), Up arrow key to select English and press Enter key to change language. I found Google Groups is easier for everyone to create your own topic to discuss everything about ME1. Try it now !